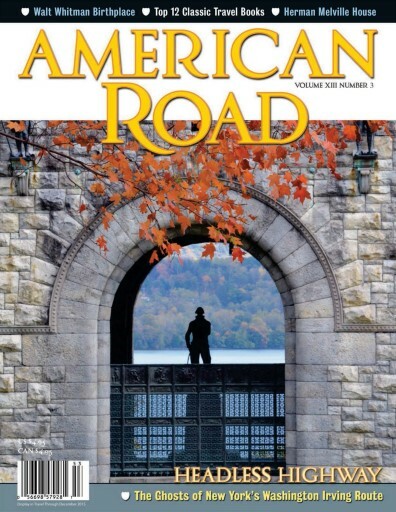 In the Autumn 2015 issue of American Road® magazine, the trip is all about literature. The lead feature, "New York's Washington Irving Route," visits the Hudson Valley haunts of the Original Knickerbocker—America's First Man of Letters—the author who set a headless horseman on the heels of Ichabod Crane. Washington Irving loved his goblins. 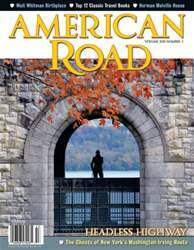 American Road® follows his ghostly pen from Sunnyside, up the river, and into the purple hills. Here lies the land of the Heer of Dunderberg—still trapped in a church belfry in Kingston, New York—and the Ramapo Salamander, whose fire made possible the forging of an iron chain large enough to lock out the Revolutionary War. They open it all with a skeleton key. "American Road's Top 12 Classic Travel Books" celebrates the best travel journals of the past two centuries, with writers such as Lewis and Clark, Ilf and Petrov, Wolfe, Kerouac, and Beauvoir at the wheel. "Literary Postcards" revisits tourist sites inspired by the Great American Novel—who wouldn't want to ride the Ben Hur Race at Coney Island or hang out in Maine with the Old Man of the Sea?—while the road departments find their way to Walt Whitman's Birthplace, Louisa May Alcott's Orchard House, and Herman Melville's Arrowhead. Ultimately, they introduce The Classic Travelogue—a new, rotating department that annotates time-honored travel texts for today's adventurer. The first installment showcases the Mono Lake chapter of Mark Twain's Roughing It (1872)—that amusing account of frontier life Twain wrote four years before he consigned Tom Sawyer and Becky Thatcher to the depths of McDougal's Cave in "The Adventures of Tom Sawyer."